In the world of urban legends, Mars Spectacular is a relatively new (though already remarkably sticky) one. It’s only been around for about the last 13 years or so, in which it’s spread mostly via email. Those earliest emails went by the title “Mars Spectacular”, though in the years since, a few alternate incarnations have sprung up, including “Mars is about to be spectacular!” (clearly false, as everyone knows that Mars is already always spectacular) and the almost poetically-wrong “Two moons on August 27th”. What they all have in common is a firm, false belief that if you look up in the nightsky on August 27th of any given year, you will see a gigantic, Moon-sized Mars, hovering next to a more normally Moon-sized Moon. But just where does this utterly untrue story come from in the first place—and why does it keep coming back? On August 27, 2003, Mars was due to make its closest approach to the Earth in 60,000 years. This close-approach would make it look ever so slightly larger in the sky than it usually did. Somehow, news of this cool-enough, but not particularly visually-stunning (or frankly, even all that noticeable) event was spun into a tale of Mars suddenly bursting forth in gigantic form on the nightsky on August 27th. That August 27, 2003—and then every August 27th thereafter—passed without this happening somehow neither stopped nor slowed the spread of the story. Each year, a new crop of Mars Spectacular emails come out (with the date shifted forward precisely one year)—and each year it utterly trounces any attempt to kill it off. 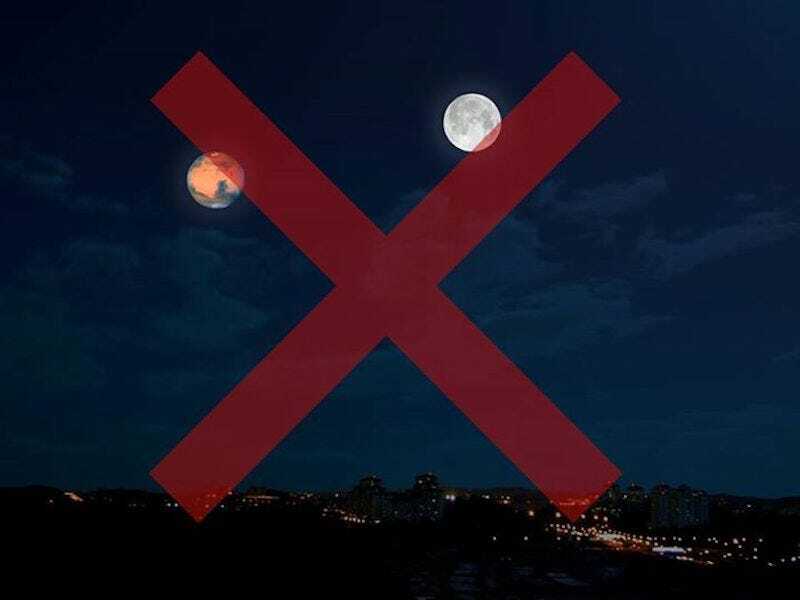 Mars and the Moon will not look the same size to you, ever. Not at all. The only way to get Mars to swell up to what you think of as Moon-sized is to build yourself a spaceship, get in it, and start driving. And by the time you do get there, the Moon will be looking pretty tiny to you. Now, quit upsetting Canada, friends, and just accept it—you’ve been hoaxed.